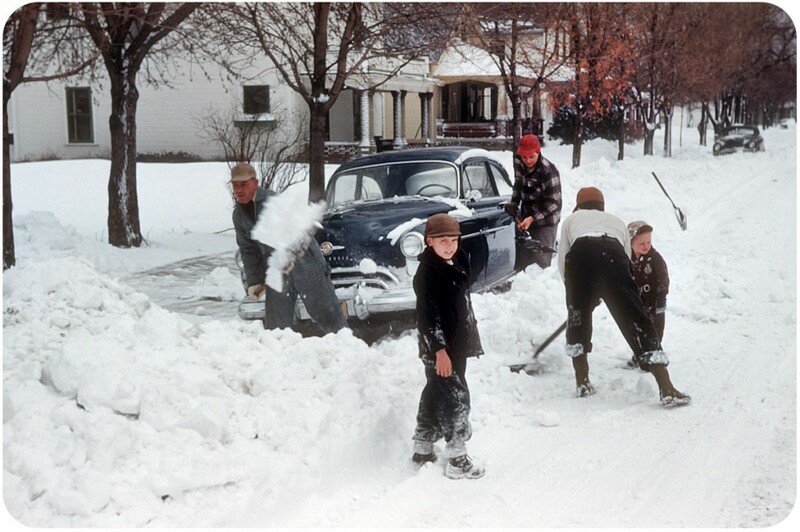 Kodachrome Snow Day in Xenia, Ohio c.1950 | A Continuous Lean. Photos from the archive of Electrospark. I know life was far from perfect back then, but boy, it sure looked it! The store signs, cars, and rolled up jeans and hats are the best! 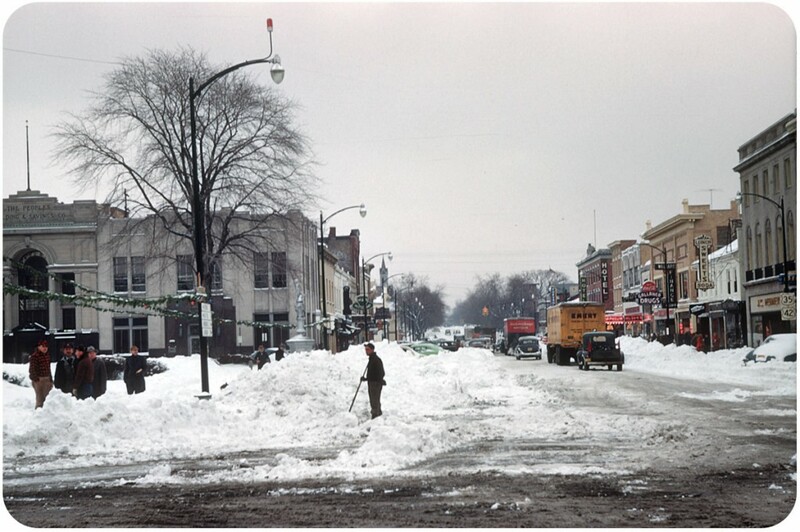 i miss the new york blizzards of “back in the days”, the snow castles, the block vs block snow wars, the knee deep snow, etc, etc. Great film. Great colors, where did you found those beauty! Great photos! Xenia is only 15 minutes from here, so It was great seeing these. Classic Pics. Love the cars on the transporter. great set, i’m from ohio and my dad’s block looks exactly like the first shot. So tragic there are not more than three of these. 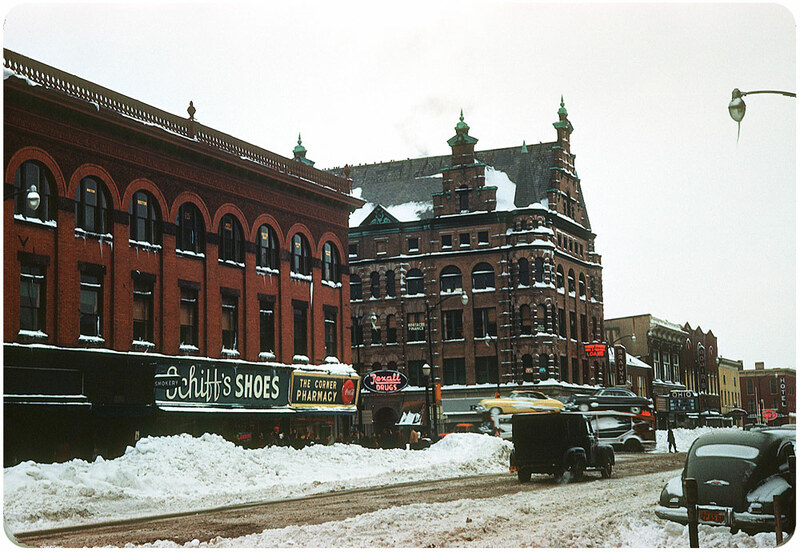 The colors Kodachrome was able to record continue to amaze me. Thanks for scanning and posting. You obviously still love Ohio. You should come back! We will gladly accept you back into the fold. Set up an ACL outpost in Cincinnati! It’s amazing how a town in Ohio can be architecturally exotic, all-American, thriving, and aspirational without descending into blandness, conformity, and mind-numbing boringness. I wonder if there are places like this in America today? What treasures and what towns we lost when we won the war 65 years ago. In regards to the last photo. I live right down the road in Kettering for school. Neat to see Xenia in the old days. Great photos of some too familiar scenes. Cool to see some love for Ohio. Makes me feel good to live here. We sure would welcome an ACL outpost here in Ohio. @mike: Gummo was based on Xenia but was not actually filmed there. Having attended college very close to Xenia, we often went there for groceries and the like, and while it certainly has its share of problems, it is nothing like the portrayal in Gummo. The thing to remember is that it’s in the middle of nowhere, surrounded by farmland, with no real industry of which to speak. It’s been hit by multiple tornadoes, the worst of which almost wiped the town off the map. And while the economy is rough now, it’s never been a town of much affluence. I love these pictures because they portray a simpler time in Xenia’s life and I for one pray it will one day look like this again. Wonderful pictures! As current Xenians, we miss much of that beautiful architecture that was destroyed in the 1974 tornado. Thanks for posting! Hi Michael: These color-rich pictures bring back memories of my early SW Ohio days. A favorite teacher commuted daily from Xenia on her motorcycle to my high school in Springfield. Good communities and great people!